A top Scottish economist has warned Scotland’s economic recovery could soon be “running on empty” unless major investment is pledged. Professor Brian Ashcroft, Emeritus Professor of Economics at Strathclyde, said the recovery could fizzle out unless Chancellor George Osborne increases spending in Scotland to help unlock vital investment by business. He said that the Scottish economy had “powered ahead” in the first half of this year but with factors such as real wages, rising household debt and house price growth remaining below pre-recession levels, recovery could be slow. 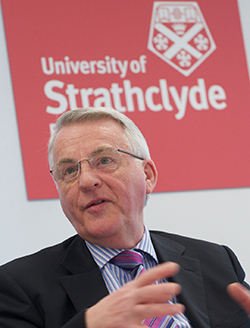 The commentary, presented in Strathclyde University’s latest Fraser of Allander Institute economic report- sponsored by PwC- reveals its forecast for economic growth in 2016 amid persistent weakness in demand. The institute forecasts economic growth in Scotland will be 2.7 per cent, which is an upward revision on the 2.5 per cent it forecast in in its last report in June to reflect the strong first-half growth. It predicts GDP growth in 2015 to be 2.2 per cent, falling to 2.1 per cent in 2016 against a prior forecast of 2.4 per cent for 2016. The latest figures show Scottish GDP grew 0.9 per cent in the second quarter of 2014, matching the growth rate for the UK as a whole. It now forecasts unemployment will fall to 124,700 by the end of this year, with the jobless rate expected to drop to 5.3 per cent and to 5.2 per cent in 2015. The unemployment rate is expected to fall again next year, but the institute expects the number of Scottish people who are out of work will increase to 141,019 by the end of next year, as the overall workforce increases before falling back to 135,537 by the end of 2016. He said: “There is no one-size-fits-all economic policy answer to overcoming the slowdown in growth impacting Scotland and the rest of the UK.